Beth's challenge this week was color. The most colorful room in my house belongs to Alice. 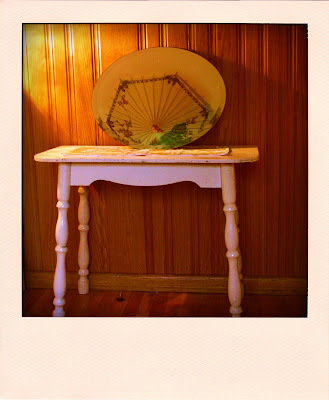 Oh, and remember my grandma's table? Here it is. I love how you can see Alice's parasol light in the mirror. i haven't died, or stopped blogging forever. I just dont have internet at home...and the house and husband are such a huge priority. 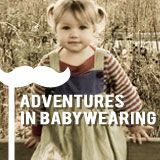 I'm going to have to take a whole day to catch up on on my favorite blogs....yours being one of them. 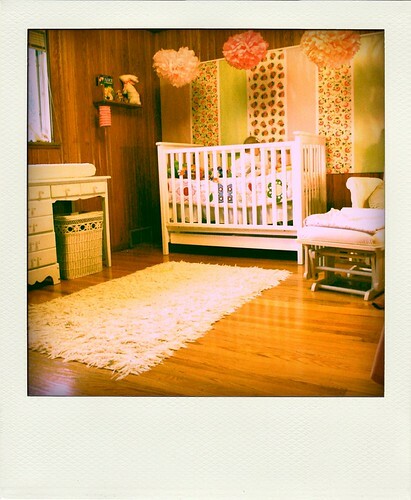 Her nursery is beyond perfect! Her bedroom is straight out of a catalog! SOOO cute! 1) I was hoping you would do Alice's room this week!! 2) These came out great, I love what people do with polaroid and have been meaning to give it a try. Thanks for the inspiration. 3) Alice is such a doll. Awesome pictures :) Yay! so cute. I love all the colors. Beautiful...your daughter and that room. I love it! Love polaroid. Love alice. Love her room. First, I love that Alice has a parasol light! How perfect is that. Her room is beautiful just like she is!! Can I come to live in Alice's room? That's your house? How come everyone knows how to decorate but me? Okay, I am totally going to do You Capture. Thanks for inspiration! 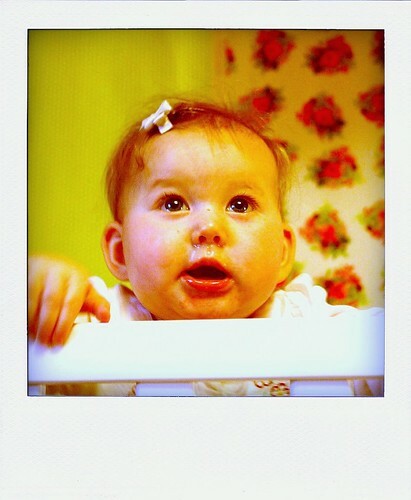 And I love the Polaroid thing, I have never seen that before. And those are BEAUTIFUL pictures. 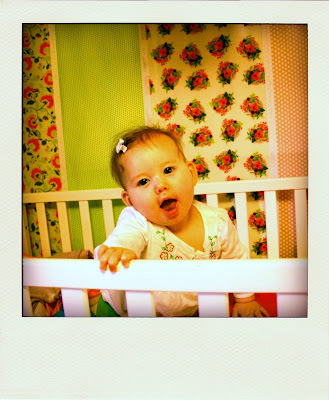 Wonderful shots, the colors are beautiful in these images, her room is adorable! I love the Polaroid tool! These are great shots. She has such a cool room. I love this nursery. Period. I'm a big fan of the pom poms and the fabric panel, and that you use the old desk for a changing table with a place for a hamper... And it is just beautiful! Oh, that picture of the girl with her little tongue just poking out and the bow in her hair. I think I melted. 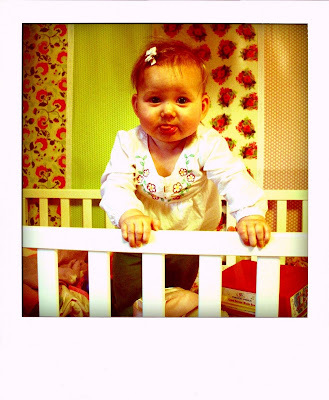 i love the colors in her room :O) the flower panels behind her crib are really cool! great job with the photos - thanks for sharing. i have my color shots posted now. feel free to come visit and check them out. leave me a comment so i'll know you were there :O). thanks. i love this room! she's pretty lovable too. That is a SERIOUSLY beautiful room. What a fun, artistic room. It looks like something out of a catalog...and it is positively spotless. Are those flowers hanging from the ceiling? Very cool.